8th century BC - In the Odyssey the body of the siren Parthenope washes ashore here after throwing herself in the sea because she fails to seduce Ulysses. 1st century BC - Villa of Lucius Licinius Lucullus is constructed, with grand gardens and buildings and water works, was considered one of the greatest pleasure grounds of its time. 12th century - The first fortifications are built here by the Normans in their traditional style, on top of the Roman buildings. 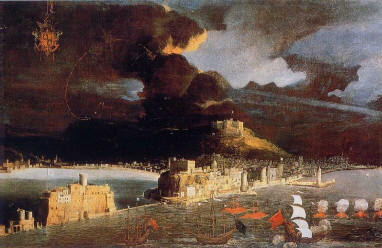 1499 - Alfonso of Aragon, first husband of Lucrezia Borgia, is King of Naples and develops the castles fortifications.